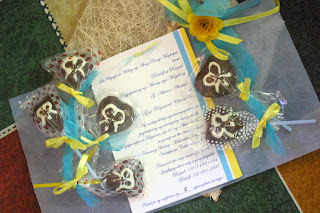 That's a copy of our invitation, the chocolate lollipops were given to us as a gift and were given to guests as well, my friends who made it actually tried to imitate our logo which was a cross in the middle of two R,which indicated me and my hubby and the Lord in the center. I know it doesn't excatly look the same though :) but still I appreciated thier effort. as in. 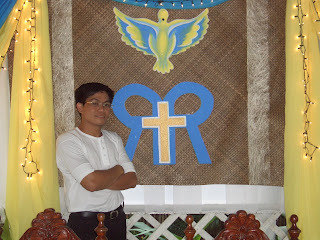 This is the logo in the backdrop,made by hubby of course..he's so payat pa jan, pero now he's as big as me na yata..and let me say..he's more pogi now.naks! galing ko nga daw mag-alaga.hehe!